Explain host and performance monitoring. AppMon uses Agents to query the data source and monitor your system health. Each Agent, except for the Node.js Agent and Web Server Master Agent, provides CPU, memory, network, and disk metrics for the host that the Agent runs on. 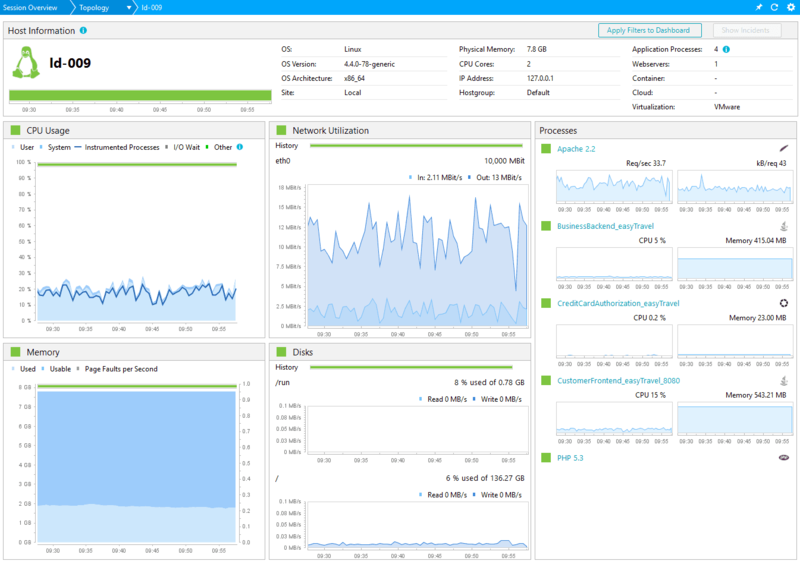 To monitor more hosts, install an AppMon Host Monitoring Agent on a machine; or simply configure a monitor that queries Windows Performance Counters, Unix system Counters, SNMP, or any other data source. Use the AppMon installation and the easyTravel demo application to learn about various AppMon features and functions. If you have an Agent installed, it&apos;s already delivering host monitoring data. You&apos;re all set. Node.js Agent and Web Server Master Agent don&apos;t deliver host monitoring data. If you don&apos;t have any other Agents installed on the machine, you have to install additional Host Monitoring Agent. AppMon 2017 May In the Cockpit, expand the Status Overview node, and double-click Infrastructure. The double-click the required server in the list. AppMon 2018 April and later In the Server section of the sidebar, click Infrastructure. The double-click the required server in the list. Configure this Agent this Agent to connect to your AppMon Server. Map this Agent to your System Profile. Give Agent some time to gather the data. Open the Host health dashboard, as described above. Monitor more than just AppMon components. AppMon provides monitors which execute on a scheduled interval, and pull data from different data sources. See Monitors for a full list of out-of-the-box monitors. Visit FastPacks and Plugins on the Dynatrace Community to download additional monitors. See Windows Performance Monitor to query all Windows Performance Counters. Run a Windows Collector service as a user with the necessary permissions. By default, the Windows Collector service runs as LocalSystem user. This service cannot open remote connections. Change this to a user with permission to open net use connections. 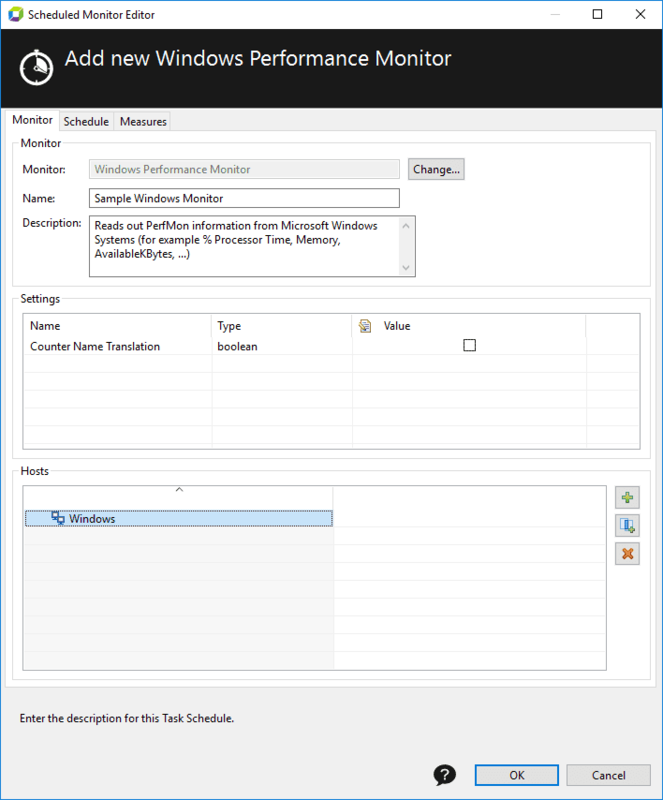 See How to Retrieve Performance Metrics with Windows Performance Monitor to learn how. Schedule the Windows Performance Monitor to run on that Windows Collector service. 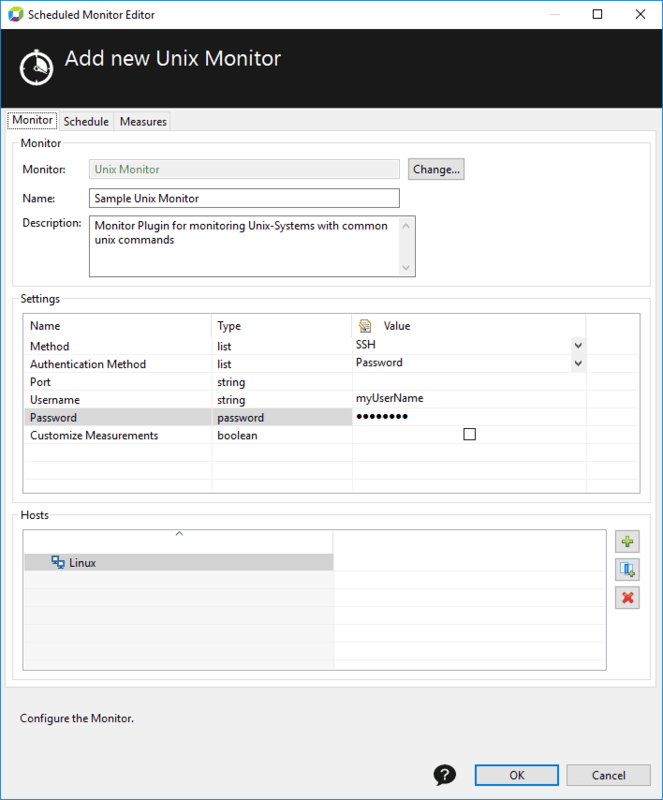 Open the System Profile Preferences dialog box, and select the Monitors item. Click Create to create a new Windows Monitor, or open an existing one for editing. When creating a new monitor, give it a meaningful name and specify the target hosts. In the Hosts pane, click +, and select the required hosts or/and hostgroups from the list. Select the Run scheduled radiobutton, and select Every Minute schedule. If needed, select Business hours. Select the target collector from the Execute on list. In the System Profile Preferences dialog box, click Apply to save and enable the new Windows Performance Monitor. Make sure a collector service is running. 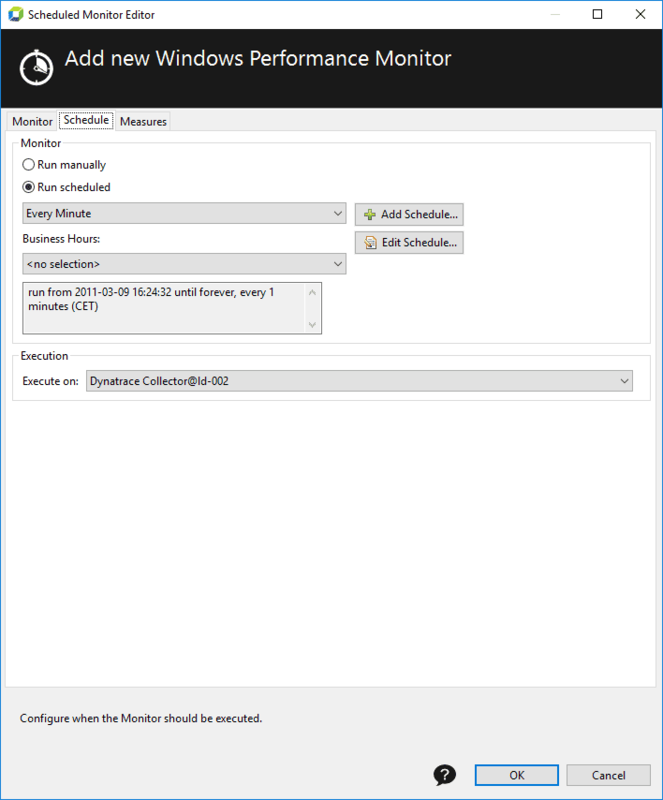 Schedule the Unix Monitor to run on that collector in the same way, as described above for Windows, but don&apos;t close the Scheduled Monitor Editor dialog box. In the Settings pane, set the Method as SSH on all of the machines that you monitor. Configure the User and Password settings for SSH to a user with permission to connect to all monitored machines. Save and enable the Unix Monitor. AppMon automatically monitors each host that contains an Agent. See Unix System Monitoring for more information. Click Settings > Dynatrace Server > Infrastructure menu. At the Host tab click Create. In the Add Host dialog box, specify the host parameters. See Infrastructure - Hosts for the parameters description. Make sure that the host is in the hostgroup for its operating system. For example, a Windows machine must be in the Windows hostgroup and a Linux machine must be in the Linux hostgroup. Find more in the Using Host and Hostgroups for Large System Monitoring tutorial. The data that the Agents capture is available in the Host Health dashboard, as previously shown. These values are also available as regular Measures that you can add to any custom dashboard or configure incidents.